Is it just me or is Goya’s name a wee bit too large on the statue’s base honoring Roberto Clemente, an important son and hero of the Puerto Rican community as well as Latinos? I’ve been mulling this over since I first saw the pictures last week but the reaction is still the same: I am very offended by the audacity that Goya had to make their name in a much larger font than Clemente’s. Puerto Ricans and Latinos already worship at the house of Goya with their kitchen cabinets serving as makeshift altars to the company so was it really necessary to make a mockery of our hero? Let’s face it, Goya doesn’t need marketing in our community since their products are like water to fish – we’re swimming in the stuff. I’ve seen many artistic installations made possible through the generosity of a corporate sponsor but who are we honoring here? 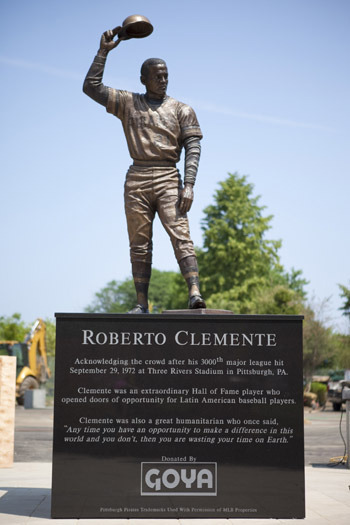 While we’re at it, why not change it from Roberto Clemente State Park to Goya State Park? Our community placed Goya where they are now so in essence, we built that statue since we’re so loyal to the brand. I strongly think Goya should not only apologize to the community, they should pay for a new pedestal AND perhaps fund a local community center or two to help keep kids off the streets and perhaps have a chance at becoming a hero like Clemente. Join Us This Weekend to Make Environmental Justice History!